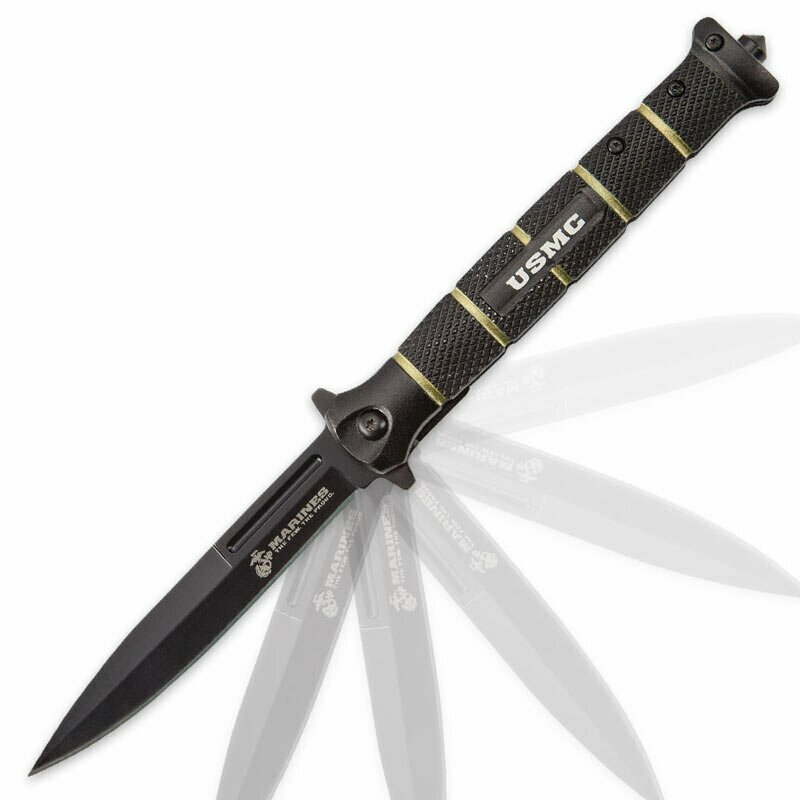 Knife United Cutlery USMC Blackout Combat Stiletto(UC3232) Knives, throwing knives, fantasy knives, movie knives, tactical knives, hunting knives, etc. An undeniably modern take on a classic folding knife design, the officially licensed USMC "Blackout" Combat Stiletto combines all the wicked ferocity of the iconic stiletto with contemporary tactical appointments and styling. Its potent 4" 420 stainless steel blade features the sleek spear point profile that old-school stiletto fans know and love and adds a distinctive blood groove and bold nonreflective black coating. Beautifully offsetting the blade's matte black finish, the famous USMC seal is carefully laser etched in white next to the razor sharp edge, flanked by the branch's illustrious, well-earned slogan - "Marines: The Few. The Proud." The chic blade deploys with incredible speed, thanks to the Blackout Stiletto's silky smooth assisted opening mechanism - easily triggered with the handy flipper. Cast from an advanced aluminum alloy, the Blackout Stiletto's handle is encircled by five green bands - an aesthetic nod to the legendary, historic USMC combat fighter knife's emblemat.